There are so may interesting things in the garden – let’s count them all, up to the number twelve. Onions, tulips, butterflies… all in brightly-colored, geometrically-shaped illustrations. As each new item is added to the garden, a new two-page spread is given with all the previous items in it. 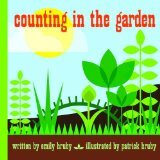 Counting in the Garden resembles an illustrated version of the twelve days of Christmas, using garden vegetables, plants and animals. Kids will have plenty of opportunity to count these items over and over again, leading to number and picture recognition.